My first project is to bind the Official Rules of Major League Baseball into a book. I bought a copy a few years ago, and it was "perfect" bound. As a result, the binding has broken and the pages have started falling out. The rule book gets some pretty heavy use, so I figure a true sewn-on-tapes binding may last longer than the copy I bought. 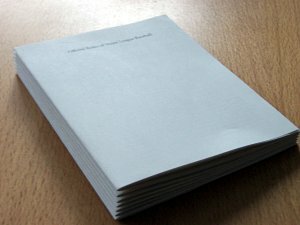 The first step in binding the Rules is to typeset and print the rules. Lucky for me, Major League Baseball has the rules on their web site. I downloaded them, and then used plain TeX to typeset the rules. Since I am printing the rules 1/4 the size of a full sheet of paper, the page ratio is the same, so I used TeX to produce full page output and then used the 'psutils' utilities to create 4-up pages in the proper order to form 16 page signatures. The font was 1.6 times the normal size, which results in fairly small print on the pages (about 80% of normal). | psbook -s16 | psnup -2 \ -- Rearrange the pages into 16 page signatures and then format them two to a page. | pstops "4:0,2,1,3" | psnup -2 > rules_book.ps -- Take the 2-up signatures and re-arrange them so they will print properly after the 2-up pages are formatted two to a page (yielding 4-up output that can be cut in half to form half size 2-up signatures). ps2pdf rules_book.ps -- the 'psutils' programs mess with the ability to print the result in a duplex printer, so I convert the final PostScript back to PDF. I've found that pretty much any printing place knows how to handle PDF, so it's probably a better final format the PostScript, even if technically it isn't. The final 4-up file was printed on long-grain Mohawk Superfine 28/70# paper, eggshell finish. It's great paper, just a touch off-white, and takes fountain pen ink very well. I had hoped to use this particular paper to bind journals, but since the grain is long, it can't be folded in half and bound. But it's perfect for a quarter-size volume. 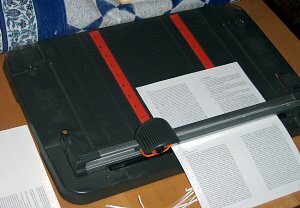 I used a rotary cutter to cut the pages in half, and then trim the bottom edge of both halves to the same size. I did this in two steps because I didn't want to try to figure out the distance I'd need to cut to get them exactly in half, but in retrospect, that's what I should have done. I wound up with pages that are all the same size, but the text on the pages will move up and down slightly because I didn't cut the sheets exactly in half on the first cut. I doubt if the effect will be obvious, though, since we're talking about less than a sixteenth of an inch. The rotary cutter also didn't do a very good job with two sheets at the same time. I have a feeling that the replaceable block of plastic that the blade cuts against should have been rotated first. I'm not going to sweat the details of this project too much, since there's a lot more I'm sure I'll get wrong later on. I used by maple folder to do the folding. It was pretty easy because there were only four pieces of paper to fold together for each signature (I'm not sure which number is properly used to describe a signature, but mine were sixteen pages of print, eight physical pages in the book, and four pieces of paper folded in half). It seems like most of the books I have that are actually sewn have eight pieces of paper folded in half to form each of the signatures. Since this book was so small, and short (only 104 pages), I figured smaller signatures would be better. Plus it's more sewing practice! The way I folded was to align the top edge of the signature pages, then align the "front" of the signatures and keep a tight grip on this edge. I laid the outer side of the signature onto the table and then folded the upper front corner over to the other top corner. Since I was keeping a grip on the corner, these first four pages were still aligned along the edge, but because of the thickness of the paper, the bottom four pages were no longer perfectly aligned. Instead of bringing the top corner flush with the inside top corner, I set it back a bit (probably about a 64th of an inch) so that the top pages were set just slightly back. Once I had the corner aligned properly, I shifted my grip to instead hold down this corner, while I aligned the other corner. Once I was happy with both corners and was convinced that the top edge of the signature was smooth, I used the folder to press the top edge of the fold, and then drew the folder down the spine of the signature, folding it. I went back across the fold a couple times, pressing down to make a nice crisp fold. Once all the signatures were folded, I have what looks a lot like a little book. There's a photo of this stage at the top of the document. The endpapers form the inside connection between the pages of the book and the cover. For this project I used "zigzag" endpapers. 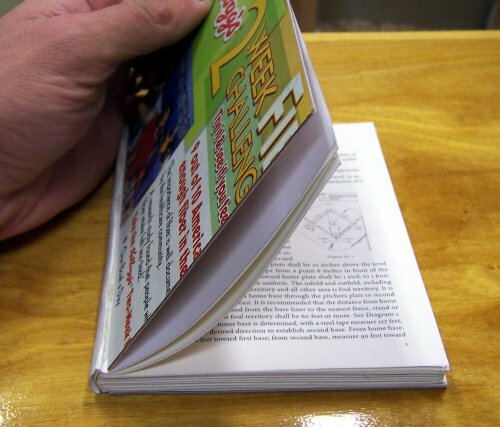 They're strong, and because of the way they're glued and folded over, the cover of the book can open fully without pulling up the first few pages of the book. Zigzag endpapers start with the waste and paste sheets folded in half, and then glued together along the folds, 1/8 of an inch from the fold. I used wheat paste glue and pressed the glued joints with a metal weight. Waxed paper kept the front and page endpapers from being glued together, or sticking to the boards. After the paste dries, the waste sheet that's pasted under the other piece of paper is folded over the paste line. The bottom half of the same piece is then folded so the new fold meets the paste (and now fold) line above it. This results in the zig zag pattern. A third piece of paper is inserted at this second fold to form the endpapers. In the image, the outermost sheet, highlighted in orange is the sheet that's folded in a zigzag pattern. The topmost leaf is removed as waste and the next sheet down (the one marked in yellow) is pasted to the covers of the book. The yellow sheet is glued to the orange one where the two overlap. The sheet marked in red is a loose sheet of paper, folded in half, and it will be stitched to the rest of the sections through the middle of it (and the orange sheet). After the endpapers have dried, we're ready to start putting the book together. The first step is to mark the spine for the location of the kettle stitches and the tapes. For this book I used three 1/4" tapes, so I marked eight lines across the spine of the book. The signatures and endpapers were lined up and held in the lying press so everything would stay aligned while I was marking them. The kettle stitches are on the top and the bottom around 1/2 - 3/4" from the ends. I laid out the three tapes unevenly, so it wouldn't be possible to put the signatures in upside down when I started sewing. Now that I've got marks across the signatures, I put the piercing board in my lying press and started piercing each of the signatures. It takes a bit of practice to get the awl to go through the middle of all the pages, but I don't think it's critical because the needle and thread will be sewn through these holes and it seemed like the sewing enlarged the holes toward the centers of the signatures. I use an attachment on my press to hold the tapes tight and in the correct position for the sewing. I started by wrapping them around the rod and pinning them. The other end was wrapped around a board that is placed into the press. After aligning the bottom of the tapes with the marks on one of the signatures, tighten the press. Then align the top of the tapes and tighten the rod assembly so the tapes are tight and straight. Sewing is done from the back of the book forward, starting with the endpapers at the back of the book. 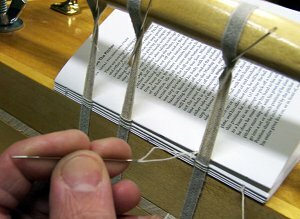 Tie a knot in the end of the thread, pass it through the first kettle stitch hole and into the center of the endpapers. The thread then goes inside the book and the needle and thread is passed back out and around the first tape. This pattern repeats until you reach the kettle stitch hole on the other side. The needle and thread should be passing back out of the endpapers. Make sure that the needle doesn't actually go through the tapes. The object is to have the thread go around the tapes, connecting the signatures together, and connecting the entire structure to the cover boards when the tapes are pasted on. The next signature is put on top of the first, and the needle and thread goes through the kettle stitch in the new section. Then you just sew back along this signature the same way until you pass out through the kettle stitch on the other side. The two signatures (or the signature and the endpapers) are tied together by making a kettle stitch between the two sections. The needle and thread comes out of the signature, and you pass it underneath the stitch formed between the previous two sections, back up and through the loop that's formed. When you draw it tight, a little knot is formed that ties the two signatures together. After the entire book has been stitched up, the endpapers need to be pasted to the first and last section. Using a waste sheet over the majority of the last page of the endpapers and the first page of the adjoined signature, a thin (1/8" or less) line of paste is brushed on. Flip the book and do the other side of the book. 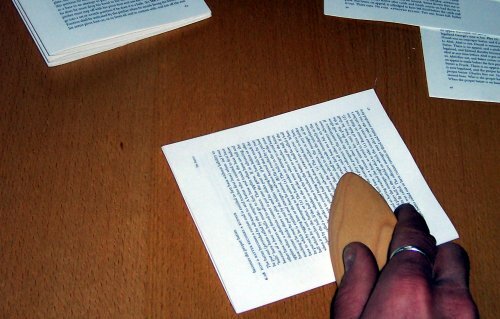 Press the book until the paste dries. Rounding and backing are the processes that keep the spine from collapsing when the book is opened, even though the thread has caused the spine to be thicker than the rest of the book (the swell). Before rounding the spine, a thin layer of paste is worked into the spine and allowed to dry slightly. This holds the sections together better than just the tapes and thread by very lightly gluing them together. I used a few thin coats of wheat paste worked into the sections with my finger. Many people use a flexible PVA glue for this, and traditionally wheat paste or hide glue made flexible with glycerin was used. I'm more of a traditionalist, but didn't want to mess around with hot hide glue, so I used wheat paste. When the spine cracks the first time I open my new book I may come quickly around to the modern method and materials, but for now I'll stick with wheat paste. To round the book, it's placed flat on the bench with the spine away from you. The lower sections are pushed away from you and the top edge of the spine is hammered lightly. I used a lightweight hammer that has one plastic, and somewhat rounded face. Flip the book over, push the lower sections away from you again, and hammer the spine. I did this a few times, and wound up with a slightly rounded spine. The bookbinding manuals I've read describe the proper rounding as a third of a circle. Backing pushes the sections into each other, further reinforcing the shape of the spine. It also shapes the book such that the text block is straight until it reaches the edge of the spine, which provides a nice shoulder for the cover boards to attach to. If the rounding and backing is done properly, the covers will fit perfectly over the text block and the edge of the spine will reach the upper surface of the boards. Between the two is the groove you see in well bound books that forms the hinge when you open the covers. To back the book it's properly placed in a strong lying press between a pair of backer boards that help create a nice sharp and even line where the spine transitions to the rest of the book. 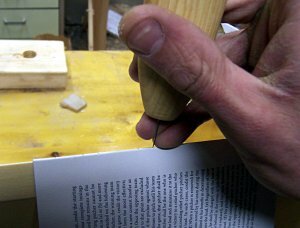 I just clamped the book tightly in my lying press and then lightly hammered across the spine edges, always moving the hammer from the middle to the outside of the spine. In the photograph, I'm moving the hammer down and to the left, driving the left edge of the spine down into the press. You can see in the photograph how the rounded spine is pinched at the corners and the sections are bent into each other toward the edges of the spine. For this end of the book, I think the left side is closer to what a properly backed spine is supposed to look like. The last step before working with the boards and the cloth used to cover the entire book is to finish the preparation of the spine. The first layer is the mull, which is the open fabric you can see in the photograph. It's a loose woven linen that's not stretchable in either direction and is pasted directly onto the spine. I rubbed some paste onto the spine, applied the mull and then rubbed paste over the mull. The mull will be pasted to the boards and provides a solid link between the text block and the covers. 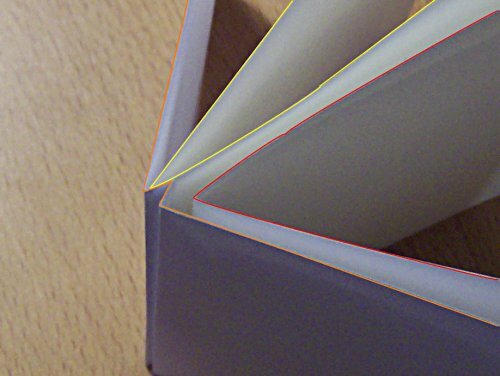 The tapes would probably be sufficient, but since they're flexible, the strength of the joint between the boards and text block would rest on the endpapers and the cover material. 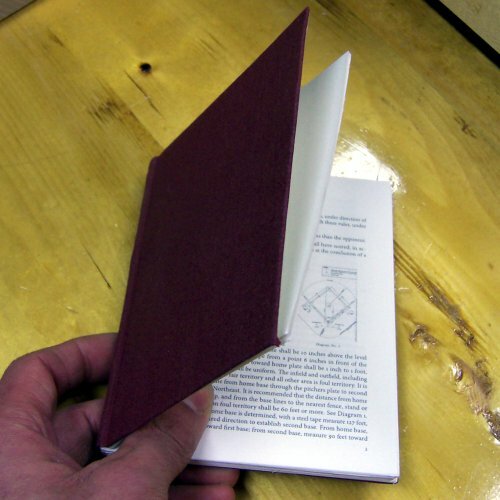 The mull strengthens the hinge between the two main parts of the book. Next on the spine is some filler paper to even up the spine between the tapes. I just used strips of paper that fit between the tapes along the spine, pasted on top of the mull. The final layer is a single strip of paper pasted over everything. 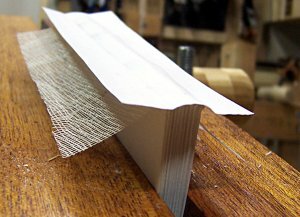 I had initially thought I would just glue the cover material right over the spine, but I decided to make a hollow back since it's clearer to me how the cloth is attached with a hollow back, and I think the hollow back may keep the back of the book looking good even if the book is opened to far and the spine cracks. After seeing how rigid wheat paste dries, I'm reconsidering using a flexible PVA on the next book I make, especially if it's a journal book that needs to open close to flat. A strip of paper is cut to be longer than the length of the spine, and three times as wide. I drew lines on the paper dividing it into thirds, and then folded the paper into the tube that would form the hollow back. I also curved it slightly by pressing it against a hammer handle so it would be easier to paste to the spine. A light coating of paste on the spine and the middle of the hollow back paper is glued on. The photograph shows this step in the process. After the paper is secure to the spine, fold over one of the wings, place a waste sheet under it, and then apply paste to the top. Remove the waste sheet and fold the other third over the pasted third and rub it until the paste has affixed them together. The result should be a hollow tube that's pasted to the spine. The cover cloth will be pasted to the outside of this, so when the book is opened, the actual spine can come away from the cloth. I decided on split boards for the covers on this project. Split boards are two pieces of cardboard pasted together, but with an unpasted section near the spine. The mull and tapes will be pasted to the boards in this gap. This is very strong, and it makes for a better looking cover because you can't see the traces of the tapes on the inside of the covers. The strength isn't necessary for this project because it's such a small book, but I figured the tapes are relatively thick compared to the cover boards, so anything I could do to lessen their visibility would be good. I used some flexible red board for the inner layer of the split boards, and some cardboard from a cereal box for the outer layer. The inner layer of the split boards is supposed to be the thinner of the two materials. For this book, the tapes and mull is trimmed to an inch and a half, so that's the depth of the split between the pasted boards. I applied a significant amount of paste to the red board, pressed the cereal cardboard carefully over the paste and rubbed it until I was satisfied that it was in a good location and that any bubbles had been worked out. I place the boards between sheets of waxed paper and pressed them beneath a sheet of steel and some bricks. While the split boards are drying the mull and tapes are pasted up between a piece of folded over paper. This forms a flange that will be trimmed and pasted into the opening in the split boards. The tapes and mull could be glued directly into the opening, but it might be hard to get the tapes to lay flat, so it's easier to get them flat between some paper and then paste in the paper. 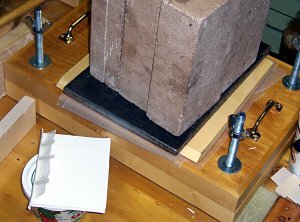 I used a piece of waxed paper on either side of the flange and clamped the book overnight in the lying press. After everything has dried, paste is liberally applied to the insides of the split section of the boards, and they're slipped over the flanges that hold the tapes and mull. One of the bookbinding manuals I have suggests rubbing the split section together over a waste sheet after pasting it to distribute the paste (and allow the excess to leak out), cleaning up the edges, and then pulling it back apart enough to slip the cover over the flange. That's what I did and it seemed to keep the mess to a minimum. I left a small gap between the hollow back and the edge of the boards to allow the covers to fold over the cloth that will cover everything. If I was using leather I would have been more careful about the width of this gap, but I think that cloth will be forgiving enough that the gap probably isn't critical. After I had everything arranged properly with the boards square to the text block and even with each other on all three sides, I pressed the whole thing in the standing press. Because the hollow back is still a bit wider than the book itself, the book is sandwiched between some flat boards with the spine hanging over the edge. I put pieces of waxed paper on both sides of both boards just in case some paste leaked out. I pressed the book pretty hard; hard enough that when I removed the book I could see the impressions of the tapes on the waste sheet and faintly on the paste sheet below. After a couple days in the press, I pulled the book out and trimmed the covers just slightly larger than the text block. This is a small book, with thin covers, and I thought it looked strange to have the covers stick out past the pages. I used the waste sheet to mark the inside of the covers and then used a utility knife to trim the boards to match. I'm using book cloth to cover the book. 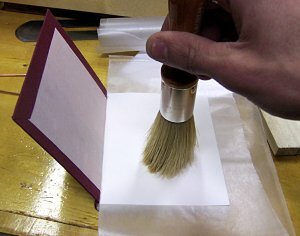 Some book cloths have paper backing that is pasted to the covers, but this particular cloth just has a shiny side that the paste is applied to. The first step is to decide how much the cloth will overlap the boards on the inside and cut the cloth to size. 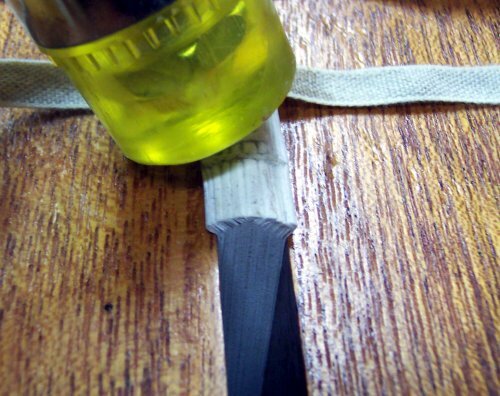 The sides of the hollow back and the top and bottom of the mull at the hinge are slit this same amount so that cloth can fold over into the cut. It's also handy to mark the placement of the spine back of the book on cloth so it's easy to get the book in position once the paste is applied. I found that the paste I was using just started getting dry as I was turning the last edge over so you do have to work quickly. You'd have even less time with PVA or hide glue. Paste is applied to the back of the book cloth, and the spine of the book is pressed onto the cloth. I pulled the cloth over both covers and then rubbed the spine to make sure it was flat and smooth. Before rubbing down the covers, I put a wire into the groove between the edge of the hollow back and the edge of the split boards, and rubbed up and down the wire. This forms the indentation that will form the hinge in the cover when the book is opened. Next, both covers are rubbed down through a piece of paper. The trickiest part of the whole covering process is turning over the top and bottom of the covers so they slide down into the hollow back and through the slits in the hinge. I started folding them over and then used a narrow screwdriver to push the cloth into the gap until it was flat and smooth. Before folding the tops and bottoms all the way over to the edges of the book, I cut off the corners of the book cloth so that the corner of the cover came within the thickness of the covers to the miter I just cut off. In other words, cut off the corners of the cloth so they're just a bit out from the cover at the corners. Then fold down and rub the top and bottom edges of the cloth. The final step is to fold over the front and back edges making sure that you neatly turn the corner so one flap of cloth covers the other flap, and that no cardboard from the boards is exposed. It's a bit like folding the wrapping paper for a birthday package. After all the edges are turned over and it looks smooth and even, press the book in the press. 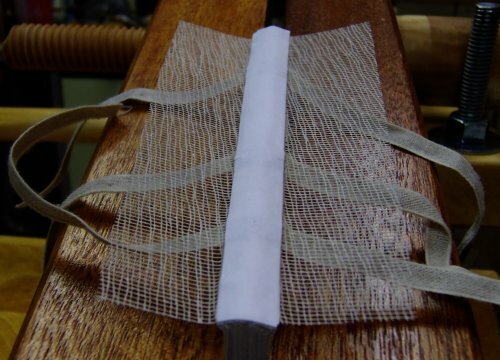 I pressed mine tightly for a few hours in my standing press, wrapped in waxed paper and with a sheet of waxed paper between the inside cover and waste sheet. Once the covers have dried sufficiently that the book can be opened without danger of the cloth coming up, the endpapers can be pasted on. Since I used zig zag endpapers, the sheet closest to the covers is a waste sheet that is torn off. The next sheet down is the paste sheet that will be pasted to cloth and exposed cardboard of the cover. The cover is opened, two sheets of waxed paper are placed under the paste sheet and the paper is brushed with paste. After the paste has been applied, the top sheet of waxed paper (with paste on it) is removed, the paste sheet is pulled tightly away from the spine and the cover is carefully pressed back over the paste sheet. After closing the book, quickly open it again to make sure the paste sheet is smooth and there's no wrinkling at the hinge. If it's not perfect, peel it back off and try again. Otherwise, flip the book and do the other side. I put the book under weights until the paste has dried. That's basically it for the structure of the book. I may add a lining sheet over the pasted endpapers to counteract the pull of the cover cloth, but structurally the book is now sound. Sew the endpapers carefully. I tore one of the holes because I pulled on the thread with the same force as inside a section. The endpapers only have two layers of paper and are more fragile. Try to keep the edges of the spine even. The mull, lining paper and hollow back on the spine served to make the backed edge of the spine wider than it really was. Probably less paste on the spine would be good. Be very careful with the paste on the colored book cloth. The paste turns the color of the cloth and if it gets anywhere else (like on the edges of the text block) it'll stain the book. Make sure the corners of the cloth are nicely mitered and turned in. Two of the corners came out nicely and the other too are a bit too pointed. Look at how smooth the endpapers are when they're pasted to the covers. The back endpaper on the book is wrinkled near the hinge because I didn't pull it tight enough.